This is a revised version of an article by Insomniac and HiveMindEmulator, originally posted on the forum. Tunnel is a Victory/Reaction card, worth 2VP, costing $3. 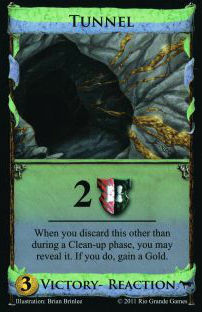 But the victory portion of this card isn’t usually the reason to pick up Tunnel — the reason you pick up Tunnel is for its lovely Gold-gaining reaction. A way of discarding cards — this is the obvious one. It’s not enough to hope that your opponent buys Militia and makes you discard. A way of making sure that Tunnel is one of the cards you discard — it doesn’t help you to discard 2 cards every turn with Oracle or something if you never actually get to discard Tunnels. A way of leveraging the Golds you get into something good — this is the most subtle, but still very important. If you’re buying Tunnels, your deck is going to have more Golds and VP cards than usual, and fewer Silvers and action cards. You don’t have a high density of good cards, but rather a high variance in card value, and you want cards that leverage this, like sifters. – Heavy sifters: Warehouse, Embassy, Storeroom. These cards are perfect because they meet all three criteria. They discard from hand (1), help get Tunnel in a postition to be discarded by drawing before the discard (2), and offer sifting to help collect the Golds together while dumping the excess VP cards (3). Storeroom in particular even adds a (4): with all the Golds, you might have some very rich hands, and its +Buy lets you make use of it. – Vault. The key is that while it’s a little weaker at (2) than the heavier sifters, it’s much better at (3), which makes up for it. One Gold in a 5-card hand with Vault gets you a Province, guaranteed, and so Vault and Tunnel love each other. Interestingly, the strategy sort of counters itself — you can discard Tunnels to your opponent’s Vaults. – Young Witch. Young Witch goes about accomplishing (3) in another way. It’s not great at turning Golds into Provinces, since you need 2 Golds and 2 Coppers in 6 cards which will likely also include Tunnels and Curses, but since it drags the game out with the Curses, you can often still get to that point. Of course, if you can find a better way of accomplishing (3), like Remodel or Salvager, that can definitely help. The example of using a late-game TfB card with Young Witch brings us to the next idea: using multiple different kingdom cards to cover all your needs. Here you get (1) and (2) from Young Witch, and add in Remodel or Salvager to provide/strengthen (3). An illustrative example is using the Horse Traders/Tunnel “combo”. At first glance, you might think that Horse Traders + Tunnel makes a good strategy. It certainly covers (1). The problem is that it’s pretty bad at (2) and terrible at (3) — you need to draw HT and TWO(!) Golds in a 5-card hand to buy a Province, which is no easy task. But clearly there’s a synergy here. You can turn this into an actual strategy by adding something like Stables or Lab. By providing non-terminal draw, they help get Tunnels in a position to be discarded (2), and by increasing handsize, they make it easier to turn Golds into Provinces (3). In a six-card hand, you just need a HT, a Gold, and 2 Coppers, which is much more easy to manange. The strategy should thus be something like opening HT/Silver to hit a few early 5s to get your Stables/Labs, then start buying up Tunnels. This is an example of the more general strategy of going for hand-size increasing + discard from hand. The discard covers (1), and the hand-size increasing covers (2) and (3). You can do this with 3-card-combos like HT+Stables+Tunnel, or you can take it more to the extreme and build a full-on deck drawing engine for the hand-size increasing, and use a discarding engine piece (Cellar, Hamlet) for discard. Other cards provide multiple functions, but need some help to complete a strategy. Examples include Cartographer (1,3), Minion (1,2), etc. Golem/Tunnel is a particular example of this — — if you only have a single Action for the Golem to find, then it will repeatedly cycle your deck and discard all your Tunnels. The problem is what your deck is doing when that’s not happening — you have hands full of Tunnels, some Golds, and once in a while your Golem. You need a really good pair card for the Golem to consider this. Sometimes you run into the First World Dominion Problem of just having too many Golds. This is a more serious problem than it seems — a hand of five Golds is not really better than a hand of three if you only have one Buy. Trash for Benefit cards are very useful, therefore, in Tunnel games because they can trash your extra Golds for various benefits. Remodel gives you a Province straight-up; Apprentice gives you 6 cards (comboing nicely with whatever you’re using to discard Tunnels); Salvager gives you +$6 and a +Buy; Bishop gives you 3VP for the Gold. In an engine where you draw your deck every turn this can be your method for greening given the right TfB, or it can be an integral part of your draw engine (Apprentice). Even in a Big Money deck it can help you hit the 2 Province turn if you can remodel a Gold and still have G/G/S or G/G/G in hand. This entry was posted in Hinterlands and tagged tunnel. Bookmark the permalink. 2 Golems and a I think it was 2 to 3 Tunnels yielded me 23 Gold by game’s end. Not as practical in most games, but sure was fun. But how many Provinces did you get, and how fast? Enough for the win (can’t recall… about 5 in a 3p game?). It wasn’t a difficult game since I was the most experienced. Probably worth mentioning Rebuild as producing (1) and (2). Needs a bit of help for (3). The cool thing about Rebuild is that you don’t need to hit $8 to get Provinces, though. One thing I’m never sure about with Tunnel is when to start buying them; I’d be interested to see some advice on this. Tunnel with cheap enablers like Warehouse seems pretty easy, as you’re unlikely to screw your deck up enough not to just keep buying both, but what about more expensive enablers like Embassy? Say there’s nothing else on the board, should I be opening Tunnel/Silver to start packing those Tunnels in early and hope to make a 5 on the second or third run through the deck, or is the early Embassy more important and I should be opening Silver/Silver? The Embassy cycling really speeds your deck up, so if you’re a little late on Tunnels you might well catch up; you’ll probably only be a turn or two behind. But if you don’t get your Embassy until late, it’s a 2 or 3 turn deficit plus a deck with undesirably many Silvers. Not nearly enough reward for that risk. A good rule of thumb is to buy Silver until you get your Tunnel enabler, then get a Tunnel. Most of the time, you don’t need or even want to win the Tunnel split, so getting Tunnel early hurts your chances of getting the enabler for no discernible benefit. The harder question is what to do once you have a Tunnel and an enabler, but then hit $3 or $4. Here I would say the answer depends on the enabler — if it’s something that’s good at (1,2), like Warehouse/Embassy/Storeroom, get more Tunnels. If it’s something that’s better at 3, like Vault/Young Witch, get another enabler. If it’s something that’s not great at any of those, well, you’ve probably built the wrong deck. if you only have a single Action for the Golem to find, then it will repeatedly cycle your deck and discard all your Tunnels. The problem is what your deck is doing when that’s not happening — you have hands full of Tunnels, some Golds, and once in a while your Golem. You need a really good pair card for the Golem to consider this. Scheme! Why rely on “once in a while your Golem” when you can put the Golem back on top of the deck *every* turn, guaranteed? Golem is normally vulnerable to drawing the card you wanted to Golem for, but Scheme is a cantrip, so no problem — just play it first, then Golem just for the cycling. You’d probably want to open Potion/Silver and wait to pick up the Scheme until you have your Golem, since it will do no good as the only Action. The big problem would be not drawing a good Golem-buying hand for a while; since Tunnels and Scheme don’t help you until after you have the Golem in your deck, it would be tempting to pick up Silver instead, but in the long run, the Silver won’t help you much, so I don’t know if that’s actually the right move. I was sort of interested about the question of whether or not to buy more silvers, so I tried the Tunnel / Golem / Scheme strategy you describe in the simulator. Against “Big Money Ultimate,” buying only one silver wins about 60% of the time. If you keep buying silver until you have a golem, it goes up to 72%. There does seem to be a slight sweet spot: buying silver if you have no golem and less than 4 silvers gets up to 76%, but it’s probably only the rare cases where this actually results in different decisions. I thought that maybe a better strategy would be to buy your first silver, then the scheme, then the rest of the silvers, since you need to spend a turn buying scheme anyway and maybe you’d get lucky with the $4P more often, but this actually seems to do slightly worse than buying the silvers before the potion. I could be wrong, but I think you’re undervaluing Silver. Even once you have the Golem engine running, it’s still gonna get you to $8 with two gold. And it’s hard to hit $4+Potion with just copper and a single Silver. In fact I might open Silver/Silver, and get the Potion on turn 3/4. The other situation I really like Tunnel in is in heavy cycling engines as a way of adding economy late. If you cycle through your whole deck nearly every turn and are using a Hamlet or Cellar or something, it’s easy to just add one Tunnel to infuse 1 or more Golds into your deck for the rest of your turns. Another thing to emphasize is that you almost never want to open Tunnel. I see people do this a lot, but it doesn’t make any sense. The chances of hitting the Tunnel right away are low, and then you basically lose $2 of value on whatever you buy on the turn you draw Tunnel compared to Silver. This seems like an overstatement, unless we have different thresholds for “almost never.” Warehouse/Tunnel has a better than 50% (just below 7/11) chance to hit the Tunnel the first time around. Storehouse/Tunnel is even better, and Hamlet/Tunnel is almost 50% (but not quite). And none of these strategies suffer much from the lack of early buying power, since your key cards are in the $2-3 range. I’d consider any of these options, although a strong supporting card at a higher cost level might change my mind. These are all unusually strong and cheap enablers though; I’ll agree that the cases where you would open Tunnel are in the minority. There’s probably not a huge difference, but I think Warehouse/Warehouse/Tunnel opening is slightly better than Warehouse/Tunnel/Warehouse. Even though with W/T/W, you have a decent chance of hitting Tunnel on the first play of Warehouse, your chances of hitting it before your next shuffle are pretty bad. You need to draw the Warehouse in the first 5 cards and the Tunnel in the first 8 cards. If you hit it turn 4, then sure you got it, but you have to wait another shuffle before you actually see the Gold anyway. If you open W/W/T, then you will often have the Tunnel purchased on turn 3 in your draw pile by turn 4 anyway, since you’re quite likely to find at least one of your Warehouses turn 3. And this way there is much less chance of the dreaded No-Warehouse-until-turn-5 disaster shuffle. Same story with Storeroom.